I love the touches of green and the beautiful linens in this room designed by Amanda Nisbet. Over time, I have collected some images of my favorite children's rooms. It seems that few designers ever feature them in their portfolios. Perhaps they prefer to focus on the more adult spaces within a home. 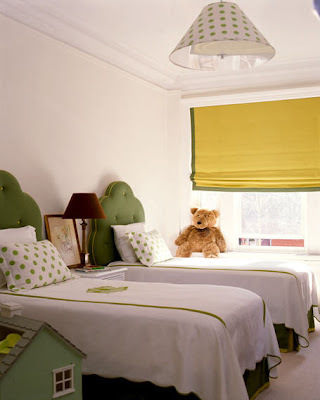 However, I think that children's rooms are often the most whimsical and fun, as they very well should be. Just a small side note: I was in Homegoods this afternoon and I saw the coolest print for a kids' playroom. It was pretty big, maybe 48"x60" and it featured the alphabet. It was divided into a grid and each square had a different letter. Instead of animals or other objects, each letter was represented by a country. A for Australia, F for France, I for India, M for Mexico, etc. Each country had its flag as well as something typical of its country like a kangaroo or the Eiffel Tower. Oh, it was so cool and only $59.99! Unfortunately, someone had it on hold and it was the only one. I would have loved it for my future children's playroom. A more sophisticated room for the little girl bound to transition from hosting tea parties for her stuffed animals to reading Jane Austen. Designer Amy Weitzman utilized a cool, lavender palette in this room and made use of every inch of space. The silhouette print is darling. A great play room by Weitzman. I love the cool lighting, pops of color, and the abundance of storage. This room was originally featured on Domino's website and has since made it onto countless blogs. I am in love with the zebra beds and the subdued palette with just the right amount of pink. 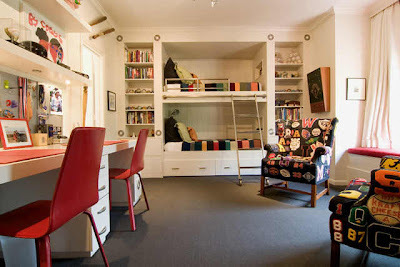 What a fun mod room for a little girl! This one is from House Beautiful. The bed is gorgeous and I love the use of pink and orange, the lucite table, and the shag rug. I first saw this nursery on Desire to Inspire. I like that it doesn't look like the typical nursery and that it isn't overwrought with furniture and accessories. This is a room from a house I featured a while back. 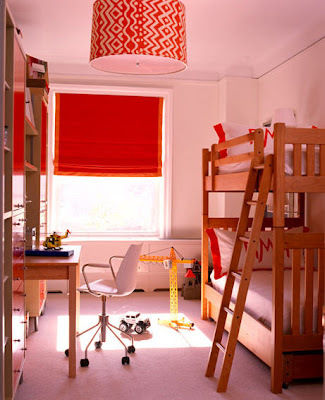 I love the bright colors, use of symmetry, and the awesome bunk beds with the rolling ladder. It is such a fun room. What more could a child want? I love the tufted kelly green headboards in the first image. I am such a sucker for anything in that color. I adore all of the monogram linens too! A crisp touch to what are usually unkempt rooms (because you know children would never keep these spaces looking like this for long!). There were so many images I liked, but those zebra print headboards are just amazing. Makes me wish I was a little girl again! I LOVE these rooms. I am still searching for ideas on decorating Ava and the new baby's room once she is out of the crib. I can not wait to do a room with two twin beds. I just love decorating kids' rooms. It is so easy to be wild and crazy with them. Makes me wish I was a kid again. dolce- Those headboards are my favorite! Sheri- Your little girls' rooms are all so cute! You've done such a great job with them. I look forward to what you come up with in the future. I love little girl rooms, of course I have two boys so the sweet room is out. You need to go back to Homegoods to see if the person holding it picked it up. are you trying to tell us something? and what is Homegoods???? and thanks for the comment - !!!! Homegoods is owned by Marshalls. We have one in Katy and I know there is one in Dallas. It's similar to the Mega Marshalls on W.Gray and Waugh, except they don't have clothes or shoes, etc. ohhh thank you for posting children's rooms! they seem to be "forgotten" in the world of design. Do you know where the gameroom rug is from? I love it!